This article first appeared in City & Country, The Edge Malaysia Weekly, on August 27, 2018 - September 02, 2018. What is your wish for Malaysia Baru? What are the three most important issues facing the property industry? Which is your favourite historic building in Malaysia, and why? Read on for their replies. My wish is that the new government will focus on safety, education and healthcare. We need concrete steps to reduce crime and make Malaysia one of the safest countries to live in. We need to ensure that the standard of public education is close to the world standard so the next generation can help the country progress further. There is also a need put aside politics in education and focus on ensuring that all Malaysians get high quality education. The government should also ensure high-quality healthcare for all citizens. The first parliamentary session assured us that institutional reforms will be carried out. I hope the leaders are prudent in ensuring that we have a good balance of development progress and reduction of government debt. Affordable housing is the most important issue currently. There is a need to ensure that every eligible Malaysian can afford to buy a home. The government should have proper planning for each development to make sure there is real demand so that there will be no mismatch. Oversupply might be disastrous for the economy. The government should also ensure proper enforcement so as to avoid having abandoned projects. KL Railway Station and Railway Administration Building are my favourite buildings. The former was built in 1910 and the latter, 1917, by British colonial architects. Both are well maintained. I still remember taking the train to Singapore from here in the 1980s. The KL Railway Station has witnessed the progress of KL. Although most people take public transport at KL Sentral now, the old station remains a beautiful piece of history and architecture. With the change in government, we are starting a new chapter, full of hope and anticipation. I wish for the country to be united as one, where we are all Malaysians, regardless of race, language or religion. Where we can live in harmony without fear or favour, where the rule of law applies equally to everyone. Where good governance is not a privilege but is to be expected from our leaders, and meritocracy is our guiding principle for decisions and policies. We need to be relevant and competitive in the global arena. This is the only way to ensure an exciting and prosperous future for each and every one of us. Affordable housing, high household debt and the oversupply situation in the residential, office and retail market sectors. To resolve the affordable housing issue, we must not only look at the supply and the facilitation of the development of affordable homes, but also the demand by raising the income levels of the population. In order to raise income levels, we must review the quality of education in the country. Education should not be politicised; only by equipping the population with the right skills and knowledge through education, and with improved productivity, can we raise income levels and achieve the home ownership dreams of our rakyat. I grew up in Johor Baru and one historic building that stands out is Bangunan Sultan Ibrahim on Bukit Timbalan. The former State Secretariat building’s design and architecture reflects a combination of Johor Malay, Islamic and colonial influences, which not only gives it its uniqueness but also a majestic aura. It is certainly an iconic landmark in Johor Baru. I would like the government to come up with a national housing policy so that every person will have a home, an integrated and affordable public transport system for every city and major town and a greener environment with the planting of more trees, reducing the use of plastic and cutting pollution. We need to build more affordable housing to cater for demand, address the mismatch between supply, demand, location and property pricing by increasing supply in the right property sectors and building more homes in areas where there is demand. We also should reduce property prices by having clearer planning guidelines, reducing red tape and implementing the Industrialised Building System. Kellie’s Castle in Batu Gajah, Perak, stands out for me. Built in 1915, the six-storey English castle with Scottish, Moorish and Indian architecture was to have a lift and a basement cellar. Scottish planter William Kellie Smith built the castle to persuade his wife, Agnes, to live in Malaya but unfortunately, he died before he could finish it, in 1926. I wish for a government that places importance on its people. Racial harmony and high religious tolerance should be a priority moving forward. Only then can the country progress and make an impact on the world stage. The loan rejection rate is currently very high, so, many people cannot afford to purchase a property of their own. The gap between affordable homes and buyers’ expectations is also an issue; low-cost housing should not necessarily compromise on quality. Lastly, the process of buying homes is too tedious — a qualified buyer has to deal with various agencies. Panggung Bandaraya DBKL in Kuala Lumpur. Besides its beautiful architecture, it also plays a significant role in promoting Malaysia’s performing arts and culture industry. These historic buildings need to be preserved for their long and rich cultural heritage. My wish is for all of us to do our part, learning from our past successes and failures, in starting a new chapter to strengthen our country’s foundation for a more progressive and sustainable future. There is a need for all stakeholders to work together to develop a holistic and coherent strategy in addressing the mismatch between the demand and supply of homes for all Malaysians. It is also crucial that we have a clear plan to improve the country’s overall productivity and income growth to support a more robust market economy while working on initiatives to help all Malaysians own their first home. The Sultan Abdul Samad Building, which faces Merdeka Square, is a prominent landmark where the nation declared its independence on Aug 31, 1957. It continues to be a popular destination for all Malaysians and serves as a beautiful reminder of the past and brings people of different ethnicities together for one unified purpose. I wish for Malaysians to live harmoniously. Each person should be given an equal opportunity to prosper in this nation. Policies implemented must benefit the people. Corruption must be erased and the culprits must be caught and punished. The three pressing issues are oversupply, affordability and balanced development. Oversupply of certain property types causes an imbalance in the ecosystem, which is unhealthy. Affordability is the availability of houses that are within the purchasing power of buyers. Increasingly, houses are getting out of reach of the average man on the street. Balanced development means ensuring growth is spread to other areas apart from the growth corridors. There will be opportunities for all to enjoy the fruits of economic growth. In Johor, Bangunan Bukit Timbalan is an outstanding historic building that embraces the rich past of the state. It was used as the State Administrative Centre as well as the command centre during the Japanese occupation. It is a very visible landmark that can be seen from Singapore and its unique design showcases the rich Johor architecture. My wish is for Malaysia to be a harmonious and racially tolerant country that practises transparency and accountability. Moving forward, politicians should argue with merit. Also, I wish May 9 could be declared Liberation Day because we were truly liberated by people power. First is housing affordability. Owning a house gives people a greater sense of security. Second, improving the country’s economy. This can be done by bringing foreign investors into the high-end residential and big-ticket investment markets. Lastly, cutting red tape in land development and reducing compliance costs. Bok House in Jalan Ampang, Kuala Lumpur. The building is gone but it is vividly clear in my memory. It was a beautiful building that featured classical European architecture. Also, the widely believed love story behind this mansion amazes me. It is uplifting to see that the new government has brought the people so much hope and spirit. I hope that it will deliver on its promises and create new policies that can improve the property market. Slow income growth versus demand for affordable housing has been an issue for many years now. Despite more developers venturing into the affordable housing segment, many of the new generation of buyers are still adopting a wait-and-see approach. The term ‘affordable housing’ also needs to be looked into more deeply and redefined, if necessary. As so many of the houses in this category are being introduced and marketed, it may create unrealistic expectations among consumers, which leads to lower buying interest as well as higher loan rejection rates. Without a doubt, Fort Cornwallis on Penang Island is my favourite. It has a long and interesting history. Built in 1786, the fort has never been engaged in combat and has now become a prime tourist attraction. Malaysia needs much more job-generating investment. Nothwithstanding the change in government, potential investors, both domestic and foreign, need to feel confident that Malaysia is embarking on a long period of political stability. That is my wish for Malaysia Baru. Stability, investment (particularly foreign direct investment) and prosperity. A revision in the Strata Title Act to enable en bloc sales to be approved by a majority of 80%. The current 100% is unworkable. DBKL should remove its requirement that office layout plans submitted for building approval must be accompanied by a certificate of completion and a tenancy agreement. Unnecessary and time wasting, exacerbating the oversupply situation. Every state should be persuaded to promulgate a scheme enabling owners of leasehold property (of whatever type) to convert it to freehold, upon payment of a scale premium. Who needs leasehold? It’s a relic of the colonial past. My favourite historic place is Merdeka Square. Overlooked by Bukit Aman and bounded by the Sultan Abdul Samad Building, the Royal Selangor Club, St Mary’s Cathedral and what was once one of Malaysia’s earlier banks, it is a living history book. It tells the story of the city’s colonial rule, hardship, floods, fires, wars and eventual independence and prosperity. An inclusive Malaysia and a transparent and effective government. The government’s role in rolling out affordable homes, as property affordability is largely associated with social inequality. Better connectivity so that developments can expand into suburbs and people can still commute to the city with ease. A good transport infrastructure will reduce the cost of living for people who choose to live in the suburbs instead of the city. Everyone deserves equal access to a greener living environment and the government should promote this for all development projects. To me, it will always be the Sultan Abdul Samad Building opposite Dataran Merdeka. It is an iconic and beautiful heritage landmark that all Malaysians can relate to. A Malaysia for all Malaysians. An improved education system, talented Malaysians who are nurtured to reach new heights, good morals. Respect for one another, humility and kindness to be the pillars of future generations. The property industry has the normal issues experienced in those of other countries. We hope Malaysia Baru can pave the way for a sustainable property industry, with a strong focus on the rakyat. This, plus proper structure and local plans, will give a quality lifestyle to all Malaysians. The 121-year-old Bangunan Sultan Abdul Samad! Its sheer Indo-Saracenic beauty, its history and its location at the confluence of the Gombak and Klang rivers truly take you back to the pre-independence era. It was at one time the biggest building in Malaya. The country was governed from here! I hope Malaysia will move forward from the old chapter and start building a stronger Malaysia Baru to improve living standards and shine again in the region. They are affordability, supply of affordable housing and economic uncertainties. The development costs, which include land, construction and compliance, have increased tremendously over the years. This has been the main hurdle for developers to price their products competitively. The affordability gap has become wider as income growth has slowed. Over the years, there have been good efforts on the part of certain government agencies to increase the supply of affordable housing. However, more effort should be put into studying the income and demographic profile of households in particular locations before any project is launched. Economic uncertainties also affect the overall demand in the property market. Purchasers are more sensible in making decisions in the current market, so property developers must ensure that they launch the right properties to meet the demand. I do not have a favourite historical building, but I think it is important to preserve such buildings because of their historical and cultural value. My wish is for all Malaysians to stay positive, embrace the future with confidence, live together in peace and harmony and have access to a quality home. Affordable housing is an important issue that needs to be addressed by multiple stakeholders such as government agencies, policymakers, financiers, utility providers and developers. They need to work together to enable more Malaysians to own a home. The iconic Petronas Twin Towers has been a towering beacon of architectural innovation for the last 22 years and serves to seed progressive forward thinking on city planning and development. It draws global attention to Malaysia and the growth of the nation as it marches towards developed country status. As a Malaysian, I wish that we can value and appreciate each other. I look forward to seeing all Malaysians realising the importance of each other in building the nation and creating Malaysia Baru. The government and private sector should work together to provide better housing schemes for the public. The foreign workers policy should be looked at to smooth out construction activities. Also, developers are facing hefty compliance costs such as utilities contributions and other authorities’ requirements. My favourite historic building is the Stadthuys, or the “Red House”, in Melaka. Built in 1650, it is the oldest Dutch building that is still standing in the East. The fact that it is still standing strong shows the quality of the workmanship back then. Improved racial integration and an enhanced Malaysian identity. We need to create stricter laws to punish those who make racially charged comments, especially politicians. The government should rationalise the development objectives of the country for the rakyat, especially the poor, and low and middle-income, rather than showing strong economic indicators whose benefits are not realised by the rakyat. The government should promote sustainable development and caring for the environment to benefit the current and future rakyat. Corruption needs to be wiped out completely. The education system needs to be reviewed to create well-balanced individuals. Review the approach to and implementation of affordable housing. Singapore’s Housing Development Board is a proven example. Business and economic development targets should be further enhanced. Tracking of implementation needs to be improved to ensure that targets are met and jobs are created to meet current and future demand. The Malay traditional home is my favourite. It is green, adapts to the climate and culture, and is aesthetically pleasing. To end corruption. We should focus on improving financial management and contract procurement, and curbing abuse of power by local authorities. These are the areas that are always prone to corruption. There is also a need to reinvest in good education and reinstate the budget for higher education that was previously cut. Over-regulation in the housing industry is limiting its growth. And there is a mismatch between demand and supply of lower and mid-range properties. Restrictive financial rulings limit property ownership. Tighten rules over other types of spending, but not on purchase of property. The Sultan Abdul Samad Building opposite Dataran Merdeka in Kuala Lumpur. The icon was fully restored to its original condition by me and my team at Arkitek MAA Sdn Bhd in 2008. Built in 1897, it was a government office before becoming a courthouse. Sime Darby Property hopes to contribute towards building a great nation that can punch above its weight globally. We are a country with great potential and our diverse communities must come together for nation building. Affordable housing for first-time homebuyers, unsold stock and the rising cost of doing business. Sime Darby Property will ensure that our products are offered at the right time with the right price, given the soft market. It is the iconic Stadthuys building in Melaka. It has evergreen architecture and is solidly built. It is still standing although it was built more than 360 years ago. Stadthuys is the oldest remaining Dutch colonial building in Asia. It has a rich past that blends well with Melaka’s local culture and historic attractions. The building also brings back good memories of my childhood spent in Melaka. Let’s stop shooting ourselves in the foot. It’s time for a paradigm shift from affirmative policies to meritocracy, and to develop and provide fair opportunities for all Malaysians. Our education system should impart skills, inspire ingenuity and cultivate values of love and acceptance. Education is a necessity that needs to be enhanced. House unaffordability could lead to social illnesses. This requires multi-level commitment to streamline actions, reduce red tape and compliance, and elevate incomes. Gazette local and structure plans for transparent practices, revisit the town planning Act and requirements for sustainable development. Lastly, improve the efficiency of the public transport system. Make it more accessible and affordable. After 61 years, Malaysia is renewing its aspiration to embrace diversity. Kampung Kling Mosque, Cheng Hoon Teng Temple and Sri Poyyatha Vinayagar Moorthi Temple — all located within a stone’s throw of each other in Jalan Tokong, Melaka — reflect our embodiment of diversity 300 years ago, long before we called ourselves Malaysians. It is my wish that, learning from the mistakes and shortcomings of the previous administration, the new government will be able to get the country back on track to become a developed and progressive nation based on policies that are transparent, equitable, non-discriminatory and people-centric. The three issues are providing every Malaysian with accommodation that is not necessarily based on the ownership model, relaxing lending guidelines but ensuring that the household debt ratio is still manageable and ensuring that projects are not overburdened by excessive costs to keep prices in check. My favourite is the Moorish-styled Sultan Abdul Samad building. It is an iconic and historic landmark in Kuala Lumpur and a popular tourist attraction, especially since it is located opposite the Tudor-style Selangor Club and Dataran Merdeka. We should emphasise doing things right from the outset. What we have been doing all this while is very wrong and there is a need to change mindsets. Lowering all costs in the delivery of affordable housing is vital, as is making available loans for affordable housing. Our building construction system has remained the same over the last decade and we need to have modern construction systems such as IBS (industrial building system) and BIM (building information system) in place for better efficiency in building management. Bangunan Sultan Abdul Samad, which is most visible during parades and is widely televised. With a vision of attaining a more liveable and happier all-inclusive-Malaysia, I wish for a more equitable, sustainable and transparent system that is adaptive and proactive to the needs of the people. Moreover, build and improve on the existing system rather than “scratch & build new” for better resource-efficiency, with firmer practice and enforcement on ground. First, there is a disparity between disposable incomes and new launch prices, which leads to larger numbers of unsold properties. Second, we need a better and more reliable central database system that is publicly accessible to enable all stakeholders to make more prudent and informed decisions. We need to unify the affordable-home agencies under one roof. And we need to empower and encourage more urban regeneration and renewal, enabled by a new ‘collective sale’ mechanism. A’Famosa in Melaka is a reminder of how we can lose our own country and how the people fought to earn back our autonomy (although it was subsequently taken over by the Dutch, and only four centuries later did we regain independence). Today, we need to remind ourselves that neo-colonialism is still an ongoing threat that has now manifested in non-physical ways. My wish for Malaysia Baru is to regain our status as one of the most progressive and advanced countries in Southeast Asia. Malaysia Baru should strive to not only be advanced in terms of technology and business but also in social, political and cultural development. Affordable housing for all Malaysians. There is a need for a comprehensive review of all delivery processes, including land and planning approvals, high charges by utilities companies for residential projects and government funds for maintenance of low-income housing. We should introduce modern planning guidelines for assisted, independent and senior living. We should promote Malaysian My Second Home more. We should promote Malaysia as a regional hub and head office for multinational corporations through incentives and trade promotions so that we can increase the take-up rate of high-end apartments, offices and hotels in city centres. One of my favourite historic buildings is the old Kuala Lumpur Railway Station. It used to showcase the importance of Kuala Lumpur as the largest railway hub in Malaya. I hope the railway station can soon be restored to its former glory as a modern transport hub and hotel, much like King’s Cross St Pancras in London. A robust and thriving economy spells a brighter future for everyone. My hope is for the government to propel the economy by proactively encouraging and creating policies that attract foreign direct investments and promote local enterprises to prosper internally and externally. We need policies that promote long-term sustainable growth — and these policies must be equitable and inclusive. There is a mismatch between new housing supply and household demand and affordability. In addition, there are multiple agencies dealing with, and providing, affordable housing. A one-stop agency would be most efficient and effective. I see the need to streamline processes to reduce compliance costs. There is also a lack of transparency and availability of up-to-date and reliable market data. An integrated database of market supply and demand indicators would help developers and financiers make more informed decisions. The Kuala Lumpur Railway Station, a Mughal-influenced building, is classic in style yet intricate in detailing. This building brings back memories of my schooldays when I had to travel between Kuala Lumpur and Kuala Kangsar. It was a time of mixed emotions. It was hard to leave my family but at the same time, I was also looking forward to being with my friends. I can still remember being dropped off at the station and walking through the building to the platform to take the Ekspres Sinaran Pagi back to Kuala Kangsar. Our wish is for Malaysia Baru to be a nation that has dignity and respect. We wish for fair and inclusive policies that will safeguard the unity of the people with diverse backgrounds, cultures, races and religions. No parties should be marginalised and everyone should be taken care of from both the economic and social aspects. First is the increasing cost of doing business, which is affecting house prices for the rakyat. The government should look into ways to address this issue in order to assist the rakyat in owning homes. Second is homebuyers’ ability to secure end-financing. This is especially so for first-time purchasers. Third is affordable housing, which is encumbered by various issues such as cross subsidisation, lack of comprehensive data and distribution and resale of subsidised housing. The Kuala Lumpur Railway Station. Built more than a century ago, it was the main railway station connecting the north and south. Today, it still serves as an important hub for commuters in Kuala Lumpur. It has a fascinating architecture that combined both east and west elements. The beautiful architecture is one of the main factors that it is recognised as an iconic building, attracting tourists from all over the world. Malaysia is a country that was built on unity, regardless of race, creed and culture. History has proven that as a united nation, we can achieve great things. I hope the rakyat will continue to stand together to build an even better Malaysia for all the generations to come. Affordability should be redefined. Also, there is still a big demand-supply gap in Malaysia with more than 120,000 new households formed each year, compared to 88,000 new houses completed each year, from 2012 to 2017. Compliance cost to be reduced and savings passed on to buyers — not including land premiums and development charges, developers bear compliance cost of 10% to 15% of GDP. I wish to see a progressive government that truly cares for every single person who contributes to nation building. I wish that everyone, regardless of race and religion, will work and live together in harmony, making Malaysia a great multiracial nation. The three issues are the property overhang, escalated and unaffordable property prices, and lack of coordination among numerous approving authorities and agencies, which continues to contribute to the overhang and mismatch between location, property type and pricing. 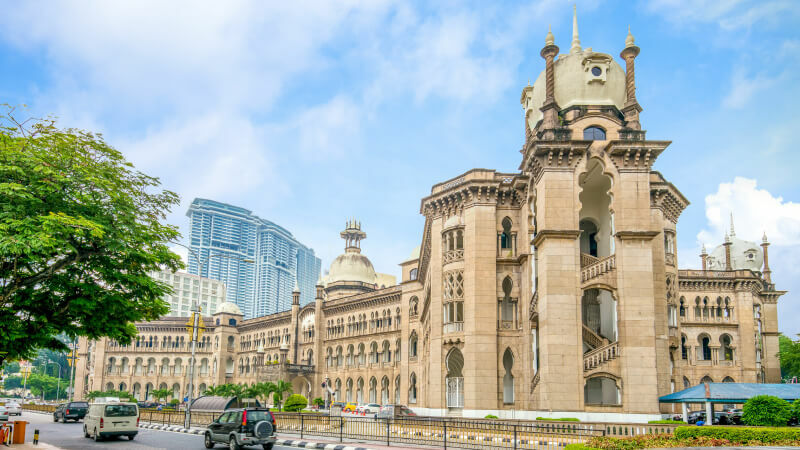 My favourite is the Sultan Abdul Samad Building for the richness of its design, which is similar to buildings built by the British in India during the 19th century. Dataran Merdeka, which lies across the road, used to be the venue for the National Day parade. I would watch the parade on the television without fail when I was young and the building makes a spectacular backdrop.